I was happily minding my own business penning historical novels, when everything went topsy-turvy, and suddenly there I was writing Stepdog – a contemporary romantic-comedy reflecting my own up-ended life, says Nicole Galland. While penning the historical novels, I’d been living on the island of Martha’s Vineyard (known to the world from Jaws and Presidential holidays) with Leuco, the world’s best dog. 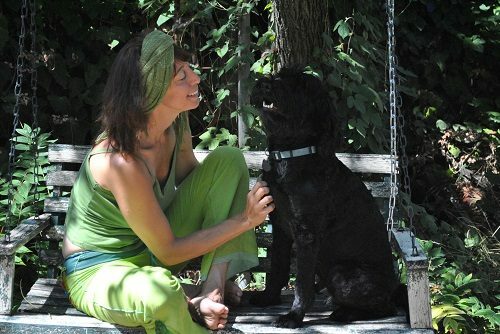 She was an unusually-mellow Portuguese Water Dog with dark, soulful eyes. She should have been a therapy dog, only I never had the time to be a therapy-dog owner. But that gentle, loving, I-am-right-here-for-you vibe radiates from her all the time. Other dog owners have swooned and sighed and told me how wonderful she is, how lucky I am. Strangers approach me on the street to say, 'I’m not a dog person but I just love your dog’s energy.' This is one special dog. When Leuco first came along, in puppy form, I’d been in an unhappy relationship. She was the life-saver I (literally) clung to for comfort and affection. When I left the relationship, she came with me. Through the pain and confusion and loneliness of separation and divorce, she was my rock, my family, my best friend. My ex hadn’t wanted her sleeping on the bed with us, but he wasn’t around now, and I could not imagine ever letting another man in my bed… so Leuco was soon leaping up onto the counterpane every night and curling up beside me. We were both happy with that arrangement. I expected it to go on for years. But then the unimaginable happened. Just a few months after my divorce, I fell in love with Billy. I didn’t see it coming. I’d been cautiously entertaining dating possibilities, but not with Billy. In fact, I’d been hanging out with him because he was a friend, and therefore the one man I knew would not try to date me. Haha – the joke was on us. We still both remember the moment that it began to happen, and the moment it was too late turn back. To make a long story short, she didn’t stay on the bed with us. Billy, an Irish actor, had been working in America on a performance visa that had recently expired; the theatre sponsoring him had closed it doors in the recession and despite many years, he was having immigration difficulties. He’d been about to enter into a 'green card marriage' with a friend of his – that is, a marriage that would give him legal-alien status in the USA. I did not want to be involved with a married man. 'But the marriage is just for a piece of paper!' he said. 'Well then get that piece of paper with me,' I said. That was our second argument. This time, I won. We eloped, and then several months later, moved in together. It was remarkable how easy it all was. For two people in their 40s – one a long-time bachelor, the other still recovering from a difficult divorce – to shack up after a few weeks of dating, and for it to go smoothly, is pretty remarkable. The only thing that didn’t go smoothly was Billy’s relationship to my dog. Well, no, to be fair, the problem was Billy’s relationship to my relationship to my dog. Leuco and I were (and remain) extremely attached to each other. Our love predated Billy, and since she was so special, she and I both expected him to love her unconditionally. In the manner of all blended families, there were… issues. These were complicated that Billy, as an actor, needed to move around a lot, and since the point of our getting married was to show the government how married we were, I had to move around with him. So did the dog. This meant we had numerous conversations that included his sighing, 'Right, so, everything is about the dog.' Everything was 'about the dog' in Los Angeles, Boston, New York and Martha’s Vineyard. Everything was about the dog through 8 moves in 3 years. Historical fiction is hard to write while one is itinerant-with-dog-and-immigrationally-challenged-actor-husband. Normally, to write a book set in the Middle Ages or the Renaissance, I would be hunkering down someplace and ignoring the rest of the world for weeks at a time (except the dog, of course). That was not an option now. Now, daily life took up so much of the spectrum of my attention that it was hard to focus upon much else. To Billy’s credit, he often took Leuco for long walks when I had a deadline, and he was terrific about exercising her when the weather was bad. Still and all, he was adamant that he did not consider her family (I obviously did), and I could not have left her with him for a research trip. When I turned in my last historical novel, I was very stressed about how to find the next story and give it due diligence. And suddenly I knew what my next novel was to be. What a story! I really enjoyed this book, perhaps more appealing to those who like rom-com's in book form (lucky for you I do!). Nicole and Leuco's special bond came through page after page, it was a fabulous read. Stepdog, a sweet, warm-hearted romantic comedy about a woman, her dog, and the man who risks life and limb to prove he’s good enough for them both, is out now.